you do not want to be this. She replied that she had used ‘fangirl’ in the general sense of the word. “I have never once doubted that you genuinely care about these people,” she assured me. And I began to think about it. I write for a website I love, namely The Fangirl Initiative, yet I’m wary of using the words ‘fangirl’ or ‘fangirling’ at all. Why? Because when I think of them, my mind conjures up images of thousands of screaming teenagers who carry the belief that somehow they’ll meet and fall in love with the object of their celebrity desire, and anyone else who looks at them had better stop right now because HE’S MINE. In Korea, a fan like this is called a sassaeng fan, and they’re something all celebrities dread. Jang Guen Suk, an actor/singer nicknamed ‘the Prince of Asia,’ once went to Twitter in a righteous rage because he had found a tracking device on his car. One singer was shamed because he shoved a ‘fan’ – who was attempting to invade the home of his fellow singer and best friend. Sometimes these ‘fangirls’ are so vicious that they actually attempt to injure the celebrity’s ‘competition.’ One singer was given a glass of orange juice by what he thought was a PA, and was rushed to the hospital. An anti-fan had put glue in the drink, and it was years before the singer was able to move past the trust issues he had from that incident. As a result of this so-called ‘fangirling,’ I try to avoid associating with the word. However, there really isn’t anything wrong with the word itself – so how do we go about fixing the stereotype that accompanies it? 1. REMEMBER PEOPLE ARE PEOPLE. In Asia, celebrities are frequently referred to as 'idols.' What we would call a kpop star is called a 'kpop idol,' and it's a term I avoid using - although the blunt honesty of it is thought-provoking. For many fans, these aren't human beings - they really are idols, practically worshipped with a religious fervor. These singers and actors are not idols of any sort - they're human beings who work hard and deserve to be treated with basic decency. I often refer to people I love as 'my baby,' but I mean this in an affectionate way. In no way do I suffer from a delusion that these people are in any way 'mine.' I've seen so many fangirls turn vicious when someone else loves 'their' celebrity - and it's reactions like this that give fangirls a bad name. Relax, people. You're watching from afar. You aren't destined to marry. Let them be happy, give them their space, and for heaven's sake, don't boycott them the second they start dating. This can be hard. People frequently equate 'fangirling' with immaturity, but it doesn't have to be this way. I can name a number of celebrities I love and pray for, but I don't plaster their posters all over my walls, dedicate shrines to them, write their names all over notebooks, or wear shirts saying "Mrs. Lee." Don't be ridiculous. Fangirling can be a huge part of your life, but you have to remember that it's just that - part. Not all. You need to be able to function in the real world while still having this love as part of you. THAT'S IT. THREE THINGS TO REMEMBER. BE REALISTIC, BE RESPECTFUL, BE MATURE. GIVE FANGIRLING A GOOD NAME. I agree with all of this! 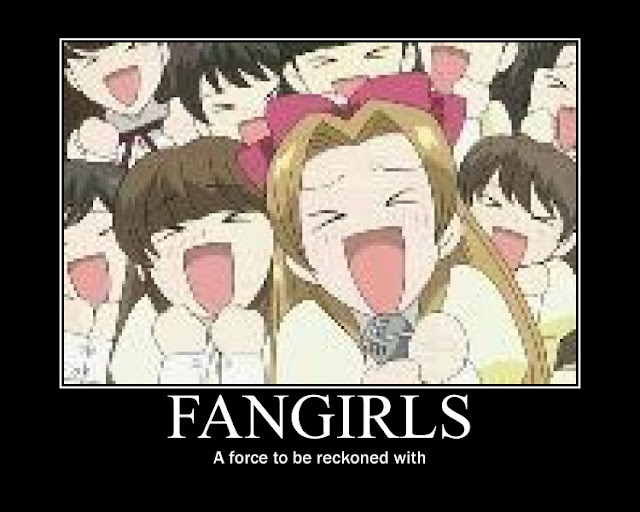 I refer to myself as a fangirl, but you have to remember to keep it limited. You don't want to overdo any of it, or be so obsessed (with a fictional character or a celebrity you will probably never meet) you ignore everything else. There are more important things in life like family, school, etc. I 100% agree with this! I can't stand the fans who get so into it that it's all they can talk about and/or go into a depression because their idol got married. I think there's a fine balance between enjoying something a lot, being passionate and excited and just being immature about it.